To browse my collection of books please click on the ‘Home’ link above. This book is also available as a free ebook - please click here. Weymouth has a long history of battling to keep the sea from flooding the town and surrounding residential areas. The first defensive sea wall was built in the 15th century. Weymouth has been ravaged by tsunamis and hurricane strength storms several times in the past three centuries with consequential devastation to its harbour and town infra structure. In 1580 a 5.8 magnitude earthquake struck near Dover creating a devastating tsunami which swept with terrifying force down the English Channel. In 1755 a three metre high tsunami wave created huge damage to most ports on the southern coast – including Weymouth. This was caused by the Lisbon earthquake which killed over 100,000 people in that city. The most recent tsunami struck ports on the English Channel in 2011. A wave about 800 mm high swept along the coast and into harbours although little damage was caused. There have been many hurricanes striking the south coast. For example, Lyme Regis was devastated with much damage and loss of life by hurricanes in 1320, 1372, 1373, 1377 and 1481. Any one of these events happening today would devastate Weymouth. Even more violent hurricanes struck in 1702 and 1824. In the earlier event all the windmills in England were destroyed. It is estimated that in Weymouth Harbour the mean sea level may have risen by as much as 3 metres. Today’s harbour defensive wall would have been totally overwhelmed by the water in the harbour pouring over the top. It is difficult to imagine the disastrous consequences for Weymouth if such a storm were to be repeated today. The town was flooded many times in the 19th century. 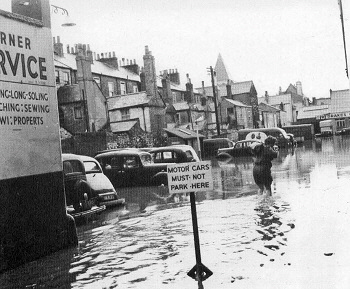 Some of these events were so serious that residents had to be rescued from their houses by rowing boats. 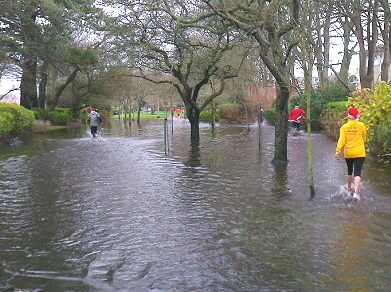 The most recent flood in 2015 saw cars stranded in deep water, the water reaching as far as the Jubilee Close Retail Park and Radipole Park Gardens being submerged. In 2002 a new sea wall was built around the eastern and northern harbour to protect the Town Centre. However, in September 2008 the sea in Weymouth Harbour came within 50 mm of over-topping that harbour defensive wall. Since then the mean sea level has risen by 50 mm due to climate change so that a flood of sea water over that wall could now occur at any high Spring tide. That threat will grow rapidly as sea levels rise so that serious Town Centre flooding could soon occur several times a decade. 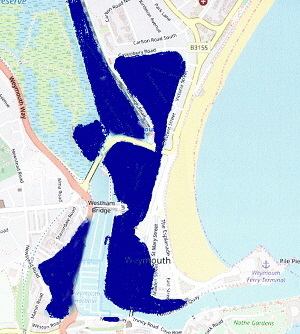 Those parts of Weymouth coloured dark blue on the map lie below the level of the top of the harbour wall and would then be unprotected by the wall. If the sea were to flood over the harbour wall by only 100 mm the water would pour into Weymouth’s Town Centre and nearby residential areas at a rate up to 3,000 tonnes per minute. This would have the potential to fill parts of the town coloured blue on the map with waist-deep sea water. This would include over two thousand properties. A tidal gauge in Weymouth Harbour is measuring a sea level increase of 5 mm per year. 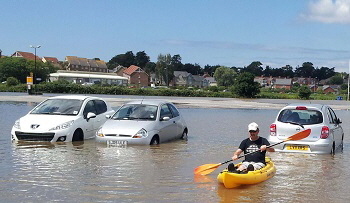 Whatever the consequences of a global effort to implement the 2018 Paris Climate Change Accord, sea levels will continue to rise throughout the 21st century at an accelerating rate such that the sea level in Weymouth Harbour by 2100 will probably be between 800 mm and 1,400 mm higher than at present. Such a rise will totally overwhelm the existing sea defences protecting the Town Centre. 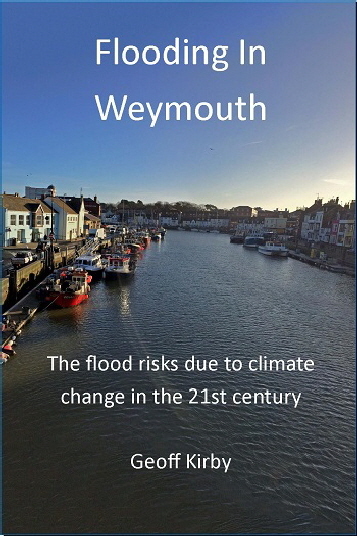 It is the author’s opinion, and the opinion of many citizens of Weymouth, that there is an urgent need to obtain financial support for flood protection and to rapidly progress the construction of flood protection schemes to protect Weymouth from disastrous flooding in this century. There are no cheap options for defending Weymouth from the sea; figures over £100 million have been calculated by planners and their consultants. 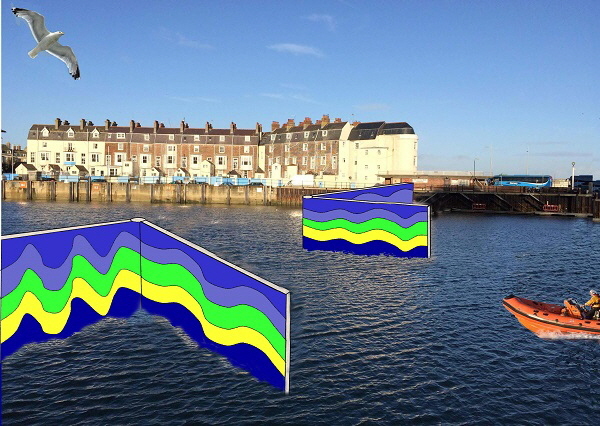 Defending Weymouth from the sea will probably require a combination of three options; a tidal barrier (the author’s view of what such a barrier might look like is below), increased sea wall height and the evacuation of the Town Centre and The Park District to a new and higher site such as Southill.